South Minneapolis’ Newest Addition, Parka. 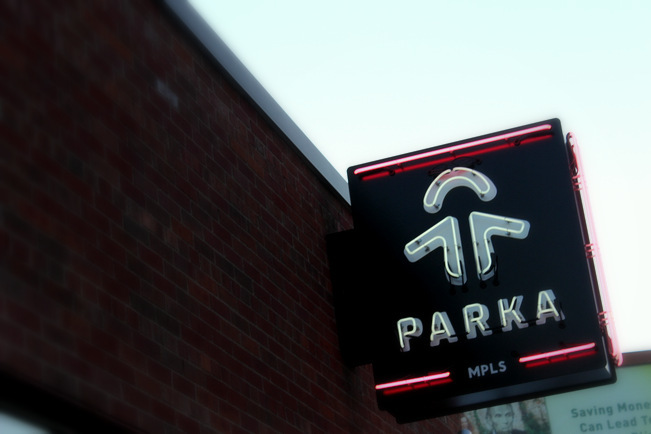 South Minneapolis is knocking it up another notch with its newest addition, Parka. The restaurant, cafe, and wine bar is an amalgamation of various Twin Cities rock star vendors, including Chef Erick Harcey of Victory 44, Rustica Bakery, and Dogwood Coffee. The restaurant has the feel of a neighborhood corner cafe. 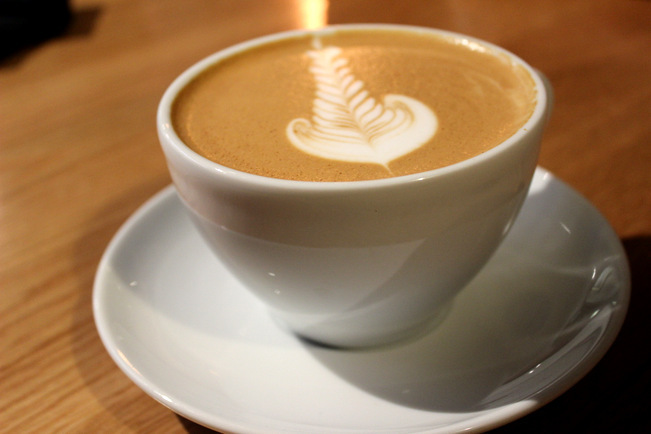 The smell of Dogwood’s beautiful coffee permeates the air and is complimented by the aroma of food wafting out of the open kitchen. When you walk in, you’re immediately greeted by a display case filled with an array of phenomenal looking pastries courtesy of Rustica and the plates of food that can be seen being delivered to tables of anxious diners look like portable trays of art. Parka’s Smoked Whitefish Starter ($8). Parka has a lot of good things going on. The food has many intricate components that create the overall compositions. This leads to a lot of exploration on the plate. Hunting and pecking through all of the gelées, foams, mousses, and various other textural and flavor elements is a lot of fun, but it does take a lot of time. It’s for this very reason that when one goes out to a fine dining restaurant, the experience often takes a lot longer than it would if one were to leisurely walk into their favorite cafe for a soup and sandwich. The place is small. Long table wait times and service are something you want to be prepared for–at least for now. The concept is a bit confusing. On one hand, you’re given the cafe theme which leads you to expect a faster in and out time, but on the other, you’re sitting down to refined food that should take a while to enjoy. I highly recommend that when going into Parka, you should go into it with more of a restaurant mentality and less of a coffee shop state of mind. 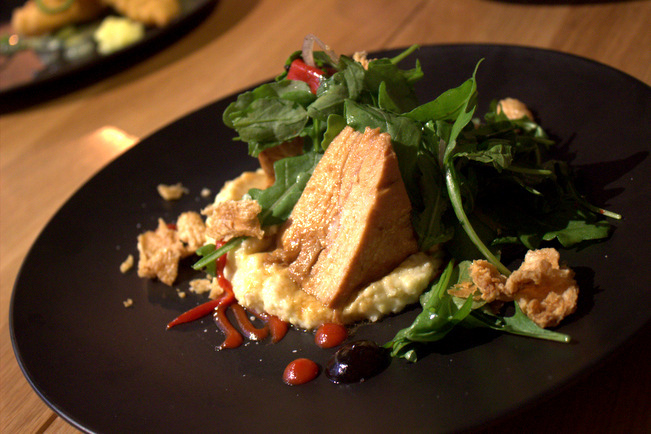 Parka’s dishes are both thoughtful and delicious. Aside from a few minor execution issues which are most certainly due to the newness of the restaurant, everything was very good. 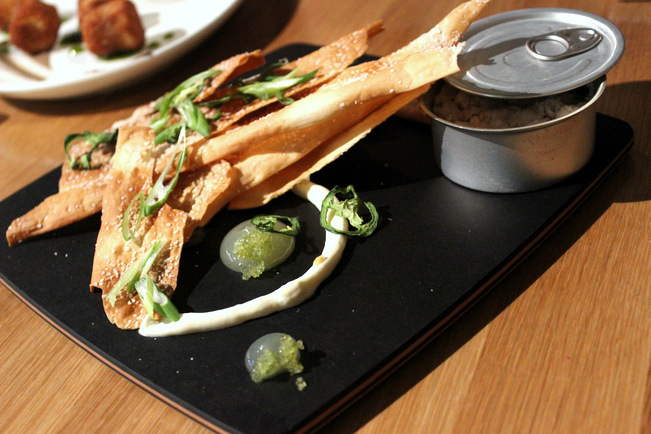 The Smoked Whitefish Starter has a complex array of flavors. There are salty elements: the fish, the pretzel flatbread, and the Tobico caviar; but the yuzu gelée brings in a level of acidity and sweetness that tones it down, as does the ribbon of cream cheese mousse. 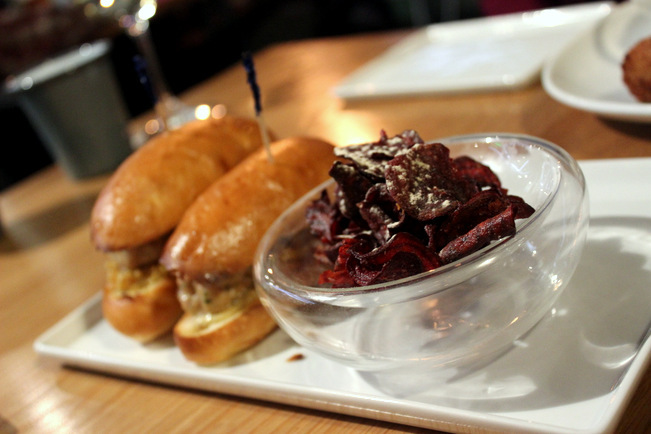 The Rabbit Meatball Mini-Sandwiches with salt and vinegar beet chips ($10). The Rabbit Meatballs were one of the highlights of the evening. Two rabbit meatball sandwiches served with an apricot mostarda and a side of salt and vinegar beet chips. Two succulent meatballs tucked into each sandwich, complimented by the sweet and sour mostarda. The Ham and Pickle Tots ($8). 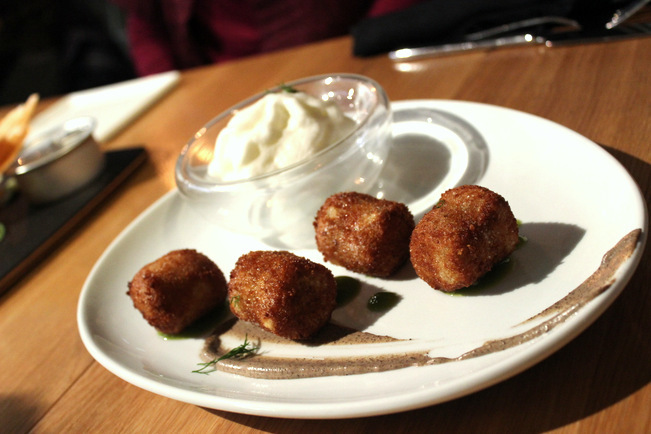 We also had to get the Ham and Pickle Tots because, seriously, how could you even think of passing them up? The crispy exterior and the creamy, salty, and hammy interior pair perfectly with the pickle gel and the cream cheese whiz. The swoosh of truffle mousse adds a nice earthiness to the dish. Parka’s Goulash with cheddar cheese mousse, cheese crisps, and dehydrated tomatoes ($12). 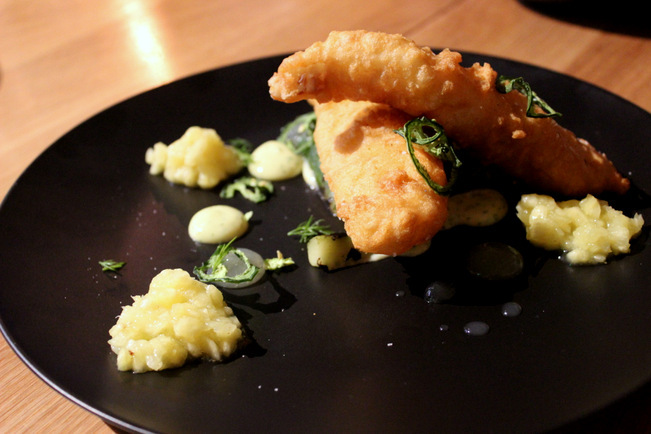 The main courses at Parka are all riffs on classic comfort food that have been given a fresh breath of life. The Goulash is a perfect wintertime pasta dish that has all of the flavors that you know and love, but comes with added flair. 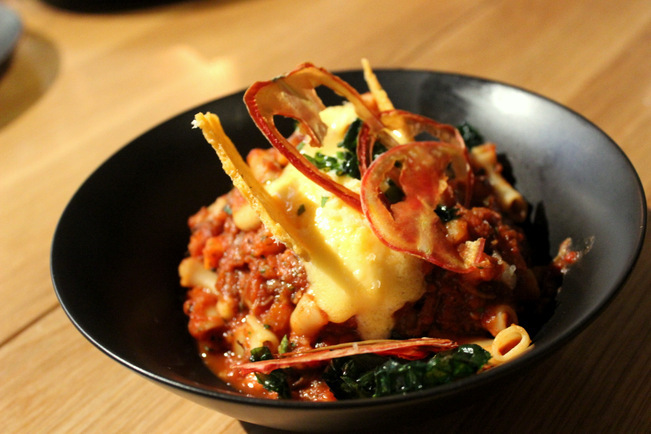 The pasta is studded with tender beef cheeks and is topped with a tangy cheddar cheese mousse. Parka’s Beer Can Chicken ($13). Parka’s Beer Can Chicken is both tender and flavorful and comes set on a bed of creamy popcorn grits. Everything is then accented by beads of varying sauces. 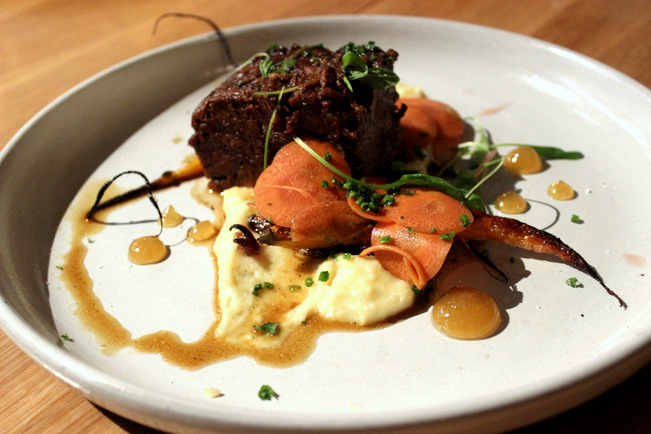 The heart-warming Pot Roast ($14). The Pot Roast is moist, tender and delicious. Served with both pickled and roasted carrots and a potato puree; it’s the kind of thing that can truly warm the soul. Overall the experience at Parka was an extremely positive one. They may have a few bugs to work out, but that comes with any new restaurant and, at the price point of their menu, you’re more than getting your money’s worth. I’m really excited to see how this restaurant develops and matures. Once they work through their growing pains, they’re certainly going to be a South Minneapolis destination location. Make sure that you don’t forget to leave Parka without a big cup of coffee and maybe grab a few pastries to go!